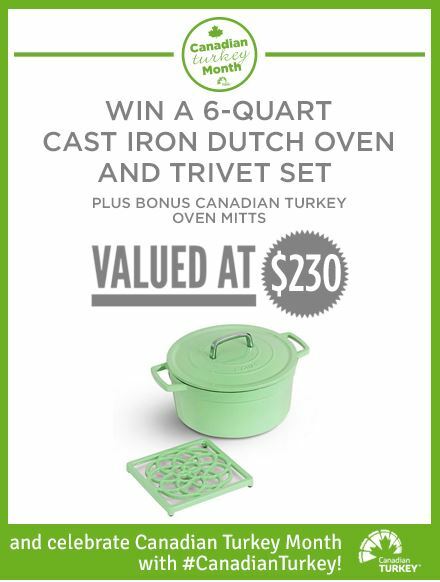 Enter the new Canadian Turkey Contest for your opportunity to win a green 6-quart enameled cast iron Dutch oven and trivet set valued at $230. This contest is open only to legal residents of Canada who are of the age of 18 and over. To enter you simply have to visit the official contest web page and provide your email address, confirm your Canadian residency and your province, you can use the same page to follow Canadian Turkey on Instagram, Twitter or Pinterest, tweet about the contest or suscribe to their YouTube channel. Contest closes on October 19, 2018 at 11:59 pm ET. Winner will be chosen at random from all eligible entries. There is one prize available to be won, consisting of a 6-quart Cast Iron Dutch Oven and Trivet Set plus a Canadian Turkey oven mitts. The Canadian Turkey Contest begins on October 13, 2018 and closes on October 19, 2018 at 11:59 pm ET. The prize draw will take place on October 23, 2018. Winner will be notified via email.